for a better greener Earth. Welcome to SpinPower™ Cycling Products! SPECIALS AND SAVINGS ›› For a limited time, get three 1 ounce lubricants for only $4! ›› FREE SHIPPING on orders over $25! SpinPower™ is a brand formulated by Prudent Enviro Products, Inc. (PEP) is a leading creator of earth-friendly, non-toxic, quality products for the cycling industry. John Prudente, a formulations chemist and cycling enthusiast, founded PEP in Greensboro, NC, in 1999. PEP offers an array of uniquely formulated items including cleaners, degreasers, lubricants, hand-cleaner, heart rate monitor conductive gel, chamois cream, bike polish, and other proprietary cycling products. 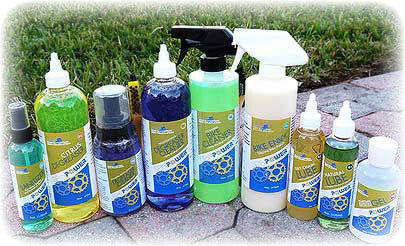 Prudent Enviro Products is a manufacturer of environmentally safe and non-toxic products. Since its founding, PEP has specialized in private labeling products for multi-outlet and catalog operations. Now, Prudent Enviro Products is offering its SpinPower™ brand to independent bike shops! John Prudente and Greg LeMond go for a bike ride! Compare our products with our competitors! Browse our SpinPower™ Cycling Products! Browse our other great SpinPower™ Products!